It’s been quite a week around here, with two little boys home with the flu (the real flu), and one Mama tethered to the house and about at her wits’ end. 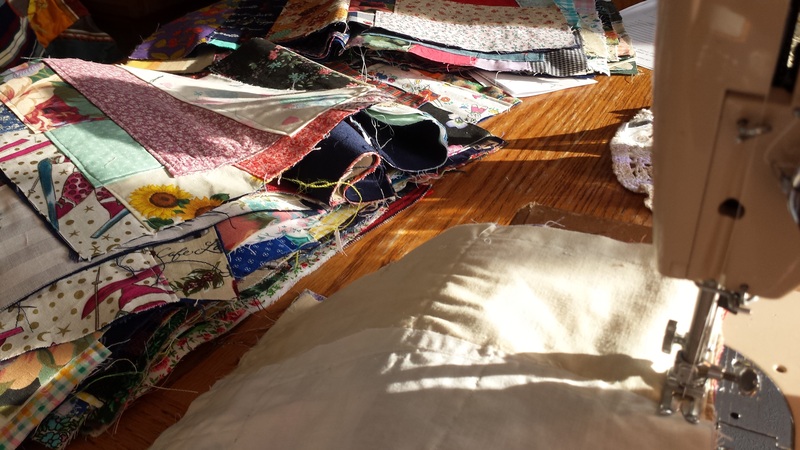 I needed work to occupy my hands and mind, but days on end of laundry and housework gets old. Fast. Eventually, I dug this silly project out of a pile somewhere, and I’ve been working at it in little bits here and there, which makes it the perfect project to squeeze in between requests for popsicles and water, medication dosages, and soothing sibling peevishness. 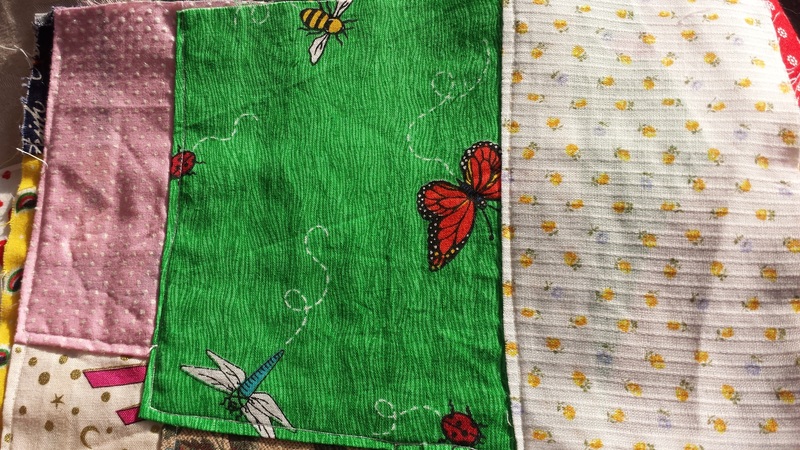 You never know what you’ll find when you walk into a thrift shop, as was the case several years ago when I stumbled on stacks and stacks of these 10″ x 10″ crazy quilt blocks. Now mind, when I say crazy, I mean CRAZY. These blocks have everything. 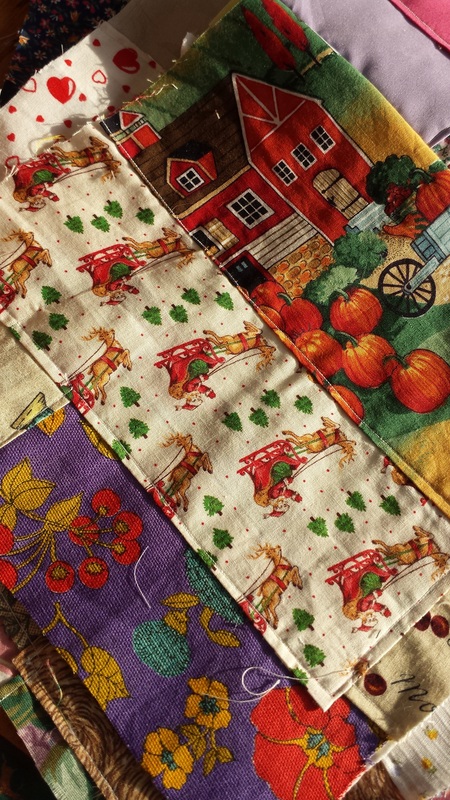 Some awesome old vintage fabric. Some crazy mod retro fabric. Some decorator fabric (of various vintages). Some scary-ugly 1980s novelty print fabric. Some fabrics that words can’t do justice. They sat in my stash for well over a year as I tried to figure out what project could absorb such chaos. 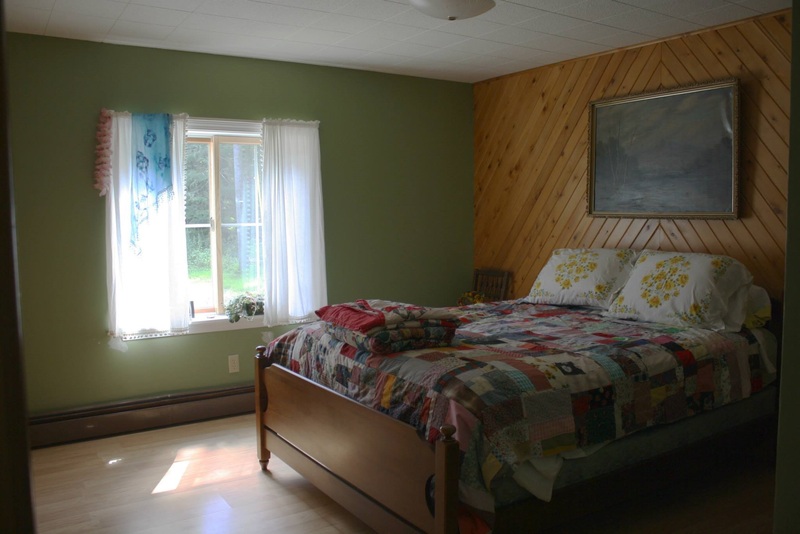 And then, when we bought this big old house, I realized that between the farmhouse and the camp at the lake, I had about 8 beds that needed dressing, and nowhere near enough blankets. In Northern Maine, where our temperatures have rarely risen above 0°F in the last 2 months, that’s a bad situation in which to find one’s self. 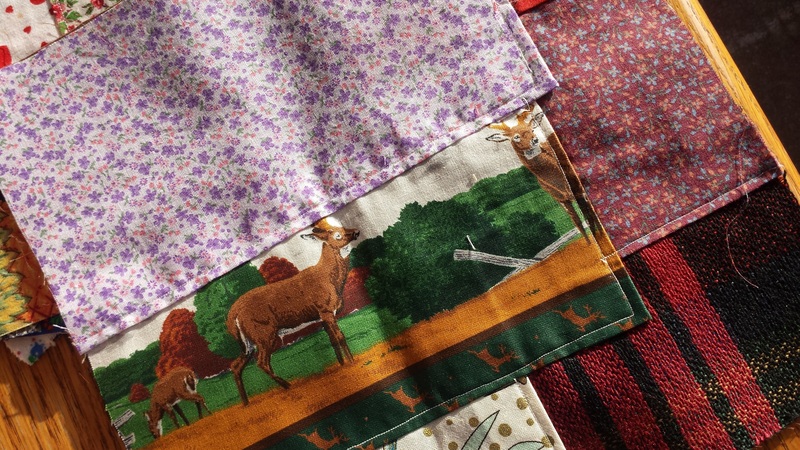 About this time last year, I put most of the blocks together into a queen-size quilt, and that now covers the master bed at the camp. To my surprise, the quilt really isn’t ugly when you look at it as a whole. In fact, all that randomness kind of merges together in a cohesive whole. 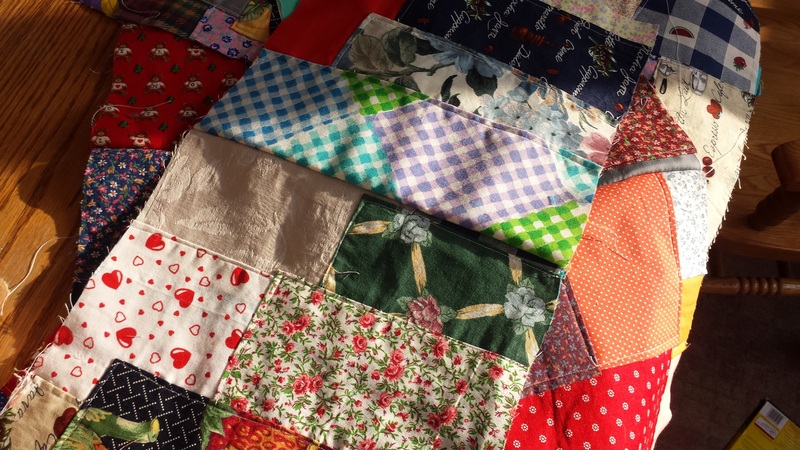 The rest of the blocks are now destined to become a full-size quilt for the futon at the camp. Stitching the blocks into strips and the strips into a whole can be done in short or long spurts, and requires no thought and little attention. It clears out space in my stash AND keeps us warm, which makes it the perfect project.